Monday, December 7, 2009 is a special day for several reasons. Two years ago, I had the privilege to witness memorial services for military veterans at Pearl Harbor, Hawaii, as part of our Oklahoma World War II Digital Learning Project. 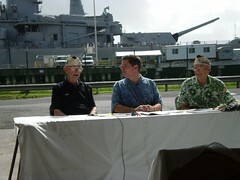 As always, I’ll be remembering our Pearl Harbor veterans and those traumatic events from 1941 on December 7th. This year, December 7th is the start of week 1 of the FREE K-12 Online Conference. Last night our pre-conference keynote speaker, Kim Cofino, shared more about her presentation in a wonderful pre-conference keynote. That session via EdTechTalk and Ustream was recorded and the archive video is available. Bookmark the official K-12 Online Conference schedule and stay tuned for more updates starting Monday! I’m going to be teaching two sections of “Technology for Teachers” this spring at the University of Central Oklahoma, here in Edmond. 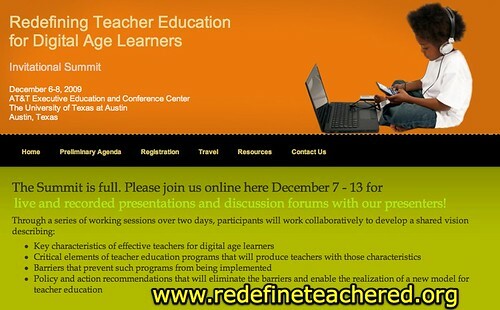 I’m excited to hear the ideas shared by presenters at the upcoming Austin conference. Join the conversations about this important topic for the future of teacher education next week on redefineteachered.org. Hat tip to Chad Fulton for the heads up on this conference. Thanks so much for sharing the info on our Redefine Teacher Ed. Invitational Summit! Just to let folks know… the virtual summit section will go live on Monday morning. We’ll kick it off with a live webcast of Tom Carroll’s presentation on “Pathways to 21st Century Teaching” at 8:25 a.m. CST on 12/7/09. Some of the presentations will take place in rooms that don’t have videoconferencing capabilities. Those will be posted to the site as soon as we can upload them to our YouTube channel. Am I the only one alarmed by how the same handful of high-tech industry corporate shills and unimaginative edtech standardistas are convened to solve every problem, real or imagined in the universe? I suppose there isn’t too much room for alarm since this event is unlikely to produce anything more significant than the vague and profoundly unimaginative ISTE Standards or the happy talk of the Partnership for 21st Century Profits.